The Huawei mobile phone you own has been assembled in just 28.5 seconds. 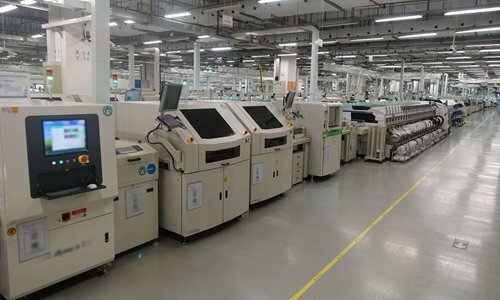 High-end automation has led the world's second largest mobile device maker to leverage synergies in research and development (R&D) that empower its production lines in South China's Guangdong Province. 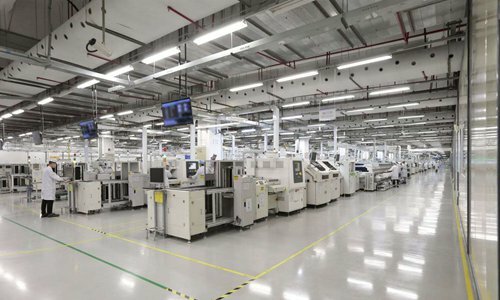 A Global Times reporter recently visited the company's smartphone factory in Songshanhu in Dongguan, a manufacturing hub known as the world's factory. At the entrance of a plant spread over an area of 1.4 square kilometers, a number of disc-like plates sit on shelves, which hold raw materials such as Kirin chipset for producing smartphones. Before being moved to production, these raw materials are scanned so that each of them gets an identity. "If a problem occurs to one component, we would know which upstream supplier provided it and trace it back [with this identity]," an employee at the plant, who preferred not to be named, told the Global Times. Earlier, a 120-meter-production line was operated with 86 workers. Now automation and technology upgrades have brought down the staff number to 17, the employee said. There are more than 30 production lines at the factory that churns out more than 2 million smartphones every month. The Chinese company, which represents the country's rise in high-end technology, has been under the spotlight in recent months. Ren Zhengfei, Huawei's founder, who usually keeps a low profile, spoke with journalists consecutively over the last few days, touching on a wide range of issues including intellectual property rights, the US' aggressive stance, arrest of its chief financial official (CFO), who is also Ren's daughter. "I'm not in a position to represent other Chinese companies, I can only represent Huawei, which has experienced several major lawsuits in the US and reached positive results," Ren told the Global Times in a group interview on Thursday. "Among 87,805 patents that the company owns now, 11,152 core patents were granted in the US, and our patents and technologies are valuable for the information society in the US," he said, noting that the company has also reached cross-licensing agreements for patents with many Western companies. While the US is pushing its major allies including Australia, New Zealand and the UK to say no to Huawei's technologies and products in building 5G networks, the arrest of CFO Meng Wanzhou, in December 2018 by Canada at the request of the US, exacerbated tensions. US federal prosecutors are pursuing a criminal investigation of Huawei for allegedly stealing trade secrets from US business partners. "We're not that concerned as the public imagines, and external changes have limited impact on us because we're confident that we can provide better products than others," Ren said during the group interview. Huawei has been dealing with different kinds of lawsuits since 2003 when Cisco and Huawei were entangled in intellectual property litigation. "We should not be bearish on its performance, as business dispute is not a big deal," Xiang Ligang, chief executive of telecom industry news site cctime.com, told the Global Times. The Chinese company has always had crisis consciousness, which helped it grow and cultivate its capabilities in countering pressure and competition, the analyst noted. The Global Times reporter saw a large part of the equipment at the production line belonging to self-owned brands. Research scholars and scientists working for Huawei are proud of their work. European-style buildings and red trains for the daily commute form a cozy working environment in Songshanhu. The company's corporate culture sees knowledge as fundamental, respecting knowledge and talent and capitalizing on it. The firm draws talent by offering high salary, employee stock ownership plans and shared benefits. Huawei invests millions of dollars every year in R&D and values innovation. "The future information society is beyond imagination. Human society will see a huge revolution in the next two or three decades, for example, artificial intelligence will help increase production efficiency and we may only need less than five people on one production line," Ren said. The 75-year-old entrepreneur also called for development of fundamental education, especially education in Chinese rural areas. "Our success today is partially thanks to foreign scientists, as the average salary in Huawei is higher than some Western firms, which helps attract many scientists to work for us," he told reporters. For now, the company has at least 700 mathematicians, more than 800 physicists, over 120 chemists and over 6,000 experts in fundamental research, according to the founder. "The only way to compete with Western countries is revitalizing education," he said, noting that Huawei still has much to do in catching up in fundamental research. Huawei's core labs are located in a building called "White House" by its staff. The white buildings are located at the center of Huawei's headquarters in Shenzhen, seen as the heartland of the company's R&D. In its advanced thermal technologies lab, about 100 engineers study heat dissipation in network products, cloud, information technology and so on to make sure components and chipsets work well when a device functions. In another lab for advanced structural materials, two 5G modules were being placed in water to test its anti-corrosion technology. After four years in water, the one with Huawei's technologies seems to look new. In Europe, some 5G modules are only permitted to be placed in sewage, which requires higher anti-corrosion ability, an employee at the lab told the Global Times. "A European customer once said that our R&D procedure is very rigorous, which is always customer-centered," the employee said. The company invested $15 billion to $20 billion in R&D in 2018 while its profits reached about $9 billion, Ren told the Chinese journalists. Politicians and intelligence agencies might have stirred up hostility against the Chinese tech firm, which could be seen as pressure tactics in the short term, Xiang told the Global Times. "Users will finally pay for telecom equipment and let the products talk. If they drop Huawei's products for some more expensive but less efficient suppliers, they will face higher costs," he said.